Motorola's CEO has confirmed the Nexus 6 was originally meant to have a fingerprint scanner, but that Apple inadvertently killed that particular dream. Dennis Woodside said that the indent on the rear of the Nexus 6 was originally meant to house a finger scanner. "The secret behind that is that it was supposed to be fingerprint recognition, and Apple bought the best supplier. So the second best supplier was the only one available to everyone else in the industry and they weren't there yet," the Motorola CEO told The Telegraph. This helps to explain a little design anomaly in the Nexus 6, that its rear dimple actually pushes through the rear frame while earlier Motorola phones just have a finger-friendly bump in the backplate. So who was behind Apple's current leading design? Apple bought AutenTec back in 2012, and it is believed to be behind the TouchID sensor hardware used in iPhones since the iPhone 5S, released in late 2013. It "wouldn't have made that big a difference," Woodside claims on the addition of a fingerprint scanner. 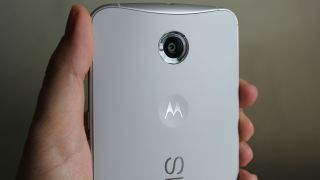 However, it leaves the Nexus 6 one of the new non-finger-scanning large phones. Samsung and Apple are very big on finger scanners these days, and even smaller phone-makers like Oppo and Huawei have used similar rear scanners in phones including the Oppo N3 and Huawei Ascend Mate 7.